Republicans have long been known as "the stupid party." They do stupid things, such as waiting until mid-November to push a must-pass tax cut that should have been done by April. But in recent weeks the GOP is finally showing some brains and some backbone on taxes. They are using their majorities in Congress to roll back and roll over the left, and it's about time. In a more rational world, tax reform could have been bipartisan. But once Democrats declared they would be unified obstructionists on tax reform, there was no reason to throw a bone to the "resistance movement." Playing nice with Chuck Schumer won't buy any votes, so why bother? It's hard not to be impressed with how Republicans have instead suddenly gotten very smart on the "pay fors" in their tax bill. Three of these revenue raisers are welcome policy changes, and they help defund the left. Start with the elimination of the state and local tax deduction. Congress shouldn't subsidize flabby and inefficient state and local services and bankrupt public pension programs. Just as one would predict, the states with the highest taxes are Democrat-controlled states. There is no evidence that higher taxes in these states lead to better schools or safer streets. New York spends around $7,500 per person on state and local government, while New Hampshire spends less than $4,500. Yet public services are better in New Hampshire than in New York. The big blue states must cut their taxes and costs, or the stampede of high-income residents from these states will accelerate. The big losers here are the public employee unions -- the mortal enemies of Republicans. This all works out nicely. 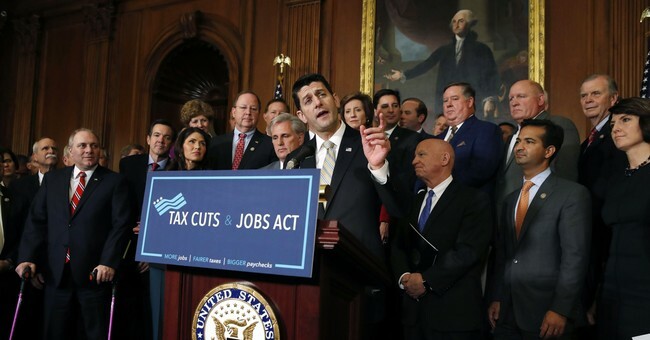 Next is the decision by Republicans to offset the cost of the tax cut by eliminating the individual mandate tax imposed mostly on moderate-income Americans. About three of four people who pay the tax earn less than $50,000 a year. The purpose of the tax is to force low-income Americans to purchase insurance they either don't want or can't afford. Isn't it amazing that Obamacare provides subsidies to Americans if they buy the insurance and imposes penalties if they don't, yet at least 13 million Americans still refuse to buy it? What a great product this must be. Finally, there is the proposed tax on college endowments. These are massive storehouses of wealth: Harvard and Yale combined sit on a nest egg of almost $60 billion, enough to give every student free tuition at these schools from now until forever. Instead, these university endowments act like giant financial trading dynasties, with very little of the largesse going to help students pay tuition. The GOP plan would put a small tax on the unspent money in the endowments if they don't start spending the money down. My only complaint is that the tax is way too low. But the first shot against the university-industrial complex has finally been fired. The productivity of American universities, as Richard Vedder of Ohio University has documented, continues to decline. Vedder also found that university tuitions don't go down when these schools have bigger endowments. They go up. These endowments subsidize the six- and seven-figure salaries of pompous, tired, and tenured professors (who teach four or five hours a week) and administrators. Bravo to Republicans for starting to turn off the spigot. The best indication that this is all working is the rise of what I call the "tax-bill crybaby caucus." This group consists of health insurance companies, Obamacare supporters, public employee unions, state and local officials, the welfare lobby, municipal bond traders, lobbyists and, most of all, the liberal politicians who are funded by all of the above. Not only are we getting pro-growth tax policy but also Donald Trump and the GOP are finally draining the swamp. It doesn't get any better than this.